We are a small software company specializing in producing Visual Basic applications for Microsoft products. Our first Excel product, ProjeX was released in 1997. ProjeX is designed to provide a simple alternative to some of the functionality of MS Project. It can be used to quickly and easily generate Gantt charts using Excel. As an Excel add-in, ProjeX requires very little extra disk space (unlike Microsoft Project) and does not require the user to learn yet another software package. All Gantt sheets are generated from Excel sheets and produced as either Excel sheets or charts. This gives the user all the power and flexibility of Excel without the training overheads of battling with Project. Because WAA is a small company we are highly focussed on what our clients require and not what we think they should require. All ProjeX developments and improvements have been driven by feedback from the client. PlaneX is an Excel add-in to generate yearly and monthly templates as a worksheet and then plot resources or project tasks as color coded timelines. This tool replicates the yearly planner commonly used in the office with added functionality. AcceX is an Excel add-in to convert MS Access database files to Excel workbooks without the user having MS Query or Access loaded on their computer. Simply select the .mdb file produced by MS Access, select the tables you want to import into Excel and the data (fields in columns) are written to an Excel worksheet. StripeX is an Excel add-in that helps the user process large batch listing prior to loading data into Excel. For example suppose you have a listing that is over 10,000 lines and has page breaks in it from the old style printers. StripeX will remove the printer feed lines and strip off just the lines you require based on a key word. StripeX also has the option to convert text files from DOS to Unix or back. TrendeX is an Excel add-in that was written to add multi-trend functionality to Excel's charts. TrendeX adds multiple trend/regression analysis capabilities to Excel charts, the regression parameters (slope and intercept) are annotated in the chart key. 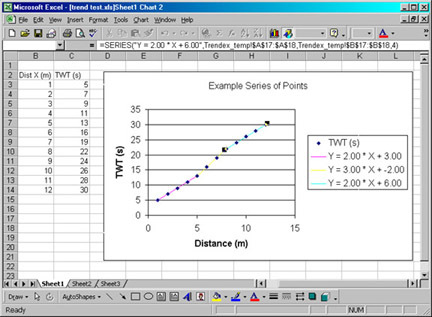 The user simply selects the points to analyze, the chart to plot the trend line on and TrendeX does the rest. Seismic Unix is a processing language available from the Colorado School of Mines. Another source of documentation is provided here because of access difficulties to other sites. There is also a search capability available.